Feeding is something where you will find opinions vary. But please remember the amount you offer should also relate to the breed of pig, the size and age of the pig compared to the amount of grass that is available and other wild food such as acorns also to be compared to the weather, how warm their bedding is to how much exercise is available to them. Then after four months 4lb a day should be sufficient, although you may find they can take 5lb a day at five months without putting on too much fat. Weaners should ideally be given food with fairly high protein levels (18%). Younger pigs need a diet high in amino acids so that they can grow proportionately more muscle tissue, so there should be more lysine in feed for younger pigs. After three months you can put the youngsters onto the adult feed that will have lower levels of protein. Too much lysine in the diet can be detrimental to growth in heavier female pigs. 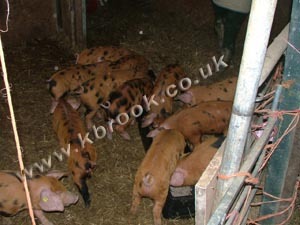 In addition to the concentrates you can offer your pig other foodstuffs like, grass, fruit, vegetables and fodder beat. DO NOT FEED; the leaves from fodder beet as this contains oxalic acid and large quantities should be avoided, as it is a gastric irritant. As are green potatoes which should be avoided. Parsnips should be avoided, as they are associated with skin lesions in and around the mouth. It has been mentioned that parsnips are a cause of poor pregnancy and associated with abortion. Cow parsley should also be avoided as well as onions, leeks and peppers. And we all know that Ragwort is poisonous.